I forgot to take the camera with me twice today. I'm a little tired and have had a headache most of the day. I wanted to take a picture of Mat's field trip but when I was almost there I realized the camera was not with me. We (Mattey, Kade, and I) went to a high school and watched part of their Spring musical, "Once Upon a Mattress". The idea was cute but the performance...not really want I was expecting. I've decided musicals aren't really my thing but Mattey and Kade enjoyed it. This afternoon we finally took the kids through the new house for our final walk through. They seemed to like it. I'm sure they'll like it better with their own stuff in their rooms and without all the boxes everywhere. This is the other place I wanted to take the camera. Maybe next time. So I'm making dinner with Mickey's help and Meg tells us there are goslings out in the yard. She goes out with a camera to take a picture for today's post. She comes back without one. I grab a camera (yes, we have multiple cameras) and go outside. 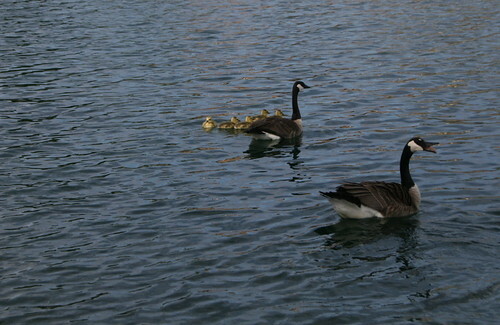 The goose family starts to wander off keeping their distance. I get a few shots from the dock but they don't turn out well because the good lens is packed somewhere. Since they had moved to the water I thought I could get a little closer without them feeling threatened. Let me just say that that daddy goose was really on guard. He started hissing at me. Not loud but enough to tell me to stay away. He swam off to be closer to his family so then I inched a little closer to the shore. While I'm taking pictures he starts swimming toward me, hissing. He's not happy with me. Of course he doesn't understand that I won't hurt them. I just want a look. I'm still taking pictures and I notice through the view finder that he's still coming towards me. I'm thinking I still have time to take a few more. He's not very fast swimming or walking. Well, I forgot that he can fly. I still have the camera to my eye and I hear the sound of wings flapping. He took a flying leap at me. He landed about 3 feet away but I didn't know that since I couldn't see him. I let out a little scream and twisted my body around to start running. When I started to move my feet got tangled up with each other and I fell hard on my...wait for it...humerus, that's the upper arm for anyone that doesn't know. I got to my feet as fast as I could because I didn't want the goose to get me while I was down. I took off right behind Meg who had watched the whole thing. The goose only took a few more steps toward me since I was running away. I ran up the stairs to the deck and right into the house. I had grass stains on my arm and both knees. Mickey asked what happened. I told him and he's laughing and saying something about sorry he missed it. The "it" was getting my goose attach on video. What a nice husband he is. Without further ado I present the picture I risked my life to get. Notice the goose's open mouth, hissing. I hope this won't give me nightmares tonight. Sounds scarey to me. Now you'll never look at a goose the same. Glad you are ok.
That story is too funny and I would love to see a video. Try it again! I don't think I'll try it again. I'm really hurting today from the fall yesterday. So much for getting my muscles to calm down. I'm also VERY glad we didn't buy a house on a lake.